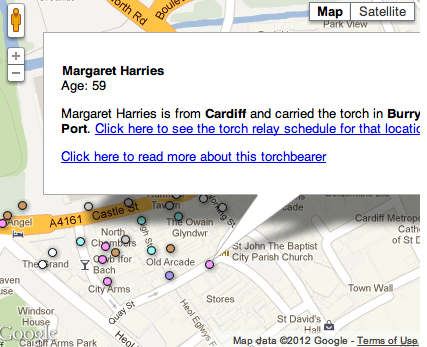 Claire Miller at Wales Online has used data from Help Me Investigate Olympics to map Welsh torchbearers. A full interactive map is available on their article. The word cloud below illustrates the words that appear most frequently in torchbearer nomination stories (a slightly different version is available here). Underneath that you can find an interactive word tree which allows you to enter specific words and see what other words and phrases are associated with them. You can also try it with sponsors’ names such as adidas, BT, etc. to see the context in which they are named. A hub that hopes to build a “sustainable group of citizen journalists” will be offering free workshops at its launch on June 29th. Tickets here. #media2012, in partnership with 3D Native, is launching its West Midlands hub with an unconference day at The Public (West Bromwich) from 10am. Visitors will be encouraged to trade skills and ideas, helping to build connections between different communities, encouraging engagement with locals and media producers to generate a unique perspective on coverage of the Olympics and beyond. On the 30th June attendees will be invited back to West Bromwich to put into the practice the skills learnt the previous day, helping to create a solid group of community journalists who are passionate about their local area and want to give it a voice. Workshops will be delivered by media workers from across the UK, including Adam Perry from Newsnet’s Media Trust who are backed by organisations such as BBC, Sky, Google, The Guardian, MTV and many more; Jon Coster from Citizens Eye, a successful citizen journalism group based in Leicester; as well as Franzi Bahrle, Jennifer Jones, Joe Hagen, Luke Holloway, Luke Seager, Ollie Clark and Steve Hands. You can find free tickets here. With Nottingham punching above its weight in being the second largest source of torchbearers, I thought I’d show where Nottingham folk will be carrying the torch. The full data is available here. If you can do anything with it, let us know. The map below adds 16 further torchbearers from Nottinghamshire towns, and colour codes the results based on age band: green for under 20s, purple for over 60s, and yellow and blue respectively for 20-40 and 41-60. UPDATE: Featured on Sport Nottinghamshire. A 101-year-old former marathon runner and multiple world record holder will be the oldest man to carry the Olympic torch, according to an analysis of data on over 6,000 torchbearers. Fauja Singh announced his retirement from marathon running shortly before competing in the London Marathon last month, his last race. A Facebook page campaigning for his nomination has gathered almost 3,000 ‘Likes’, which helped contribute to the announcement of his participation in the torch relay last weekend. Previously the oldest participant was reported to be Diana Gold, who will be 100 when she carries the torch through Barnet. 11-year-old Dominic Macgowan from Birmingham can claim to be the most youthful torchbearer named on the London 2012 website – although almost 2,000 of the 8,000 torchbearers are yet to be announced. The analysis also reveals that the median age of torchbearers is 35, but teenagers dominate the field, with the most common age of torchbearers being 17, and almost a quarter of torchbearers aged 19 and younger. And London boasts by far the most torchbearers: its 355 torchbearers account for five times as many as the second most popular home town: Nottingham, with 66. Nottingham does particularly well for its population of around 285,000, less than a twenty-fifth of Greater London’s 7.2 million, although London’s 355 torchbearers do not include those who are more specific about their hometown, naming London suburbs such as Ealing and Harrow. Cities feature heavily in the top ten, including Glasgow and Aberdeen, Belfast, Manchester, Sheffield, Bristol, Leeds and Bournemouth. 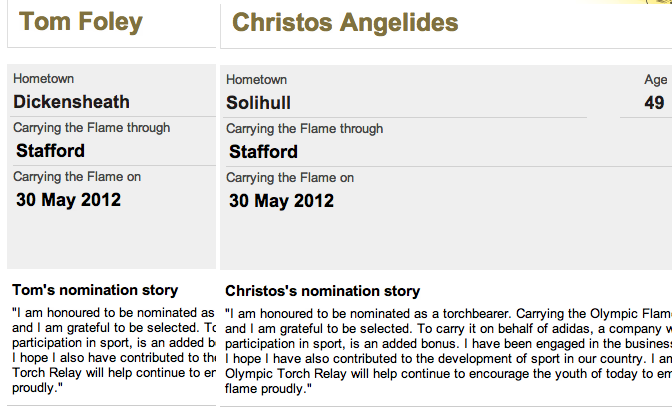 Wales is the only part of the UK unrepresented, with Cardiff’s 31 torchbearers putting it at 14th. We’ll be publishing further analysis of the torchbearers later this week. Thanks to Zarino Zappia and Scraperwiki for helping with the collation of data.